It’s about that time again, your weekly dose of wrestling’s past: Throwback Thursday! For the first time in a while, we have a date cluttered with memories. March 12 was the day Mae Young, Nidia, and current NXT star Hideo Itami were born in 1923, 1979, and 1981 respectively; the WWF held four live events on the same day in 1988; Jimmy Snuka became the ECW Television Champion at the company’s first TV taping in 1993; Mick Foley lost his ear in a WCW live event in Germany in 1994; and ECW held its final Living Dangerously pay-per-view in 2000. While I would love to turn back to that ECW pay-per-view, we continue with our origin stories on our road to WrestleMania. As we build towards the showcase of the immortals, we have a look at this year’s WrestleMania card before rewinding to the genesis of some of this year’s main acts. This week we place our focus on “The Cerebral Assassin”, “The King of Kings”, member of The Authority and current COO of the WWE, “The Game” Triple H as he makes his WrestleMania debut at the 12th instalment of the event. The quick results are as follows: Vader, Owen Hart, and The British Bulldog (with James E Cornette) defeated Ahmed Johnson, Jake ‘The Snake’ Roberts, and Yokozuna (with Mr Fuji); Roddy Piper defeated Goldust in a Hollywood Backlot Brawl; Stone Cold Steve Austin (with Ted DiBiase) defeated Savio Vega; The Ultimate Warrior defeated Hunter Hearst Helmsley (with Sable) in 1 minute 39 seconds; The Undertaker defeated Diesel to take his undefeated streak up to 5-0; and Shawn Michaels (with Jose Lothario) defeated Bret Hart during overtime to win the WWF Championship in the first ever 60-minute Iron Man match. Just to quickly recap my thoughts on the event as a whole, this was an event that was very, very near to a dud. 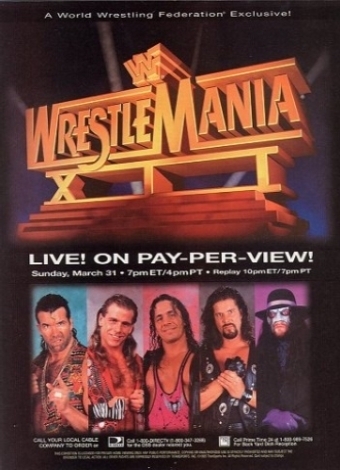 If it weren’t for the masterpiece that was the Iron Man match between Michaels and Hart, this event would have had practically nothing of value. Unfortunately, that does include the match in which one Triple H made his WrestleMania debut as “The Connecticut Blueblood” Hunter Hearst Helmsley. I mentioned above that the match, in total, took 1 minute and 39 seconds. So clearly, this was a squash match. However, it was not a traditional squash match in the fact that Helmsley garnered some early offence including a Pedigree. It just turned out that The Ultimate Warrior was immune to normal WWF physicality, as he stood up immediately following the “finishing” manoeuvre. This match was clearly about The Ultimate Warrior making his triumphant return. It was the first time he had been in the WWF since 1992, and Helmsley was nothing more than a failed experiment by that point. It really wouldn’t be until the formation of D-Generation X that Triple H would make something of himself. It really is crazy to look back at that match and compare him to the legend he would become. He has championships to his name left, right and centre including 13 reigns at the top of the mountain. He’s won the Royal Rumble, the King of the Ring, and has numerous PWI awards including two historic matches of the year. It is also a little-known fact that he has an unblemished luchas de apuestas record, retiring Cactus Jack in 2000 and unmasking Kane in 2003. He is a wrestling legend, a certified future Hall of Famer, a visionary businessman, and he lost to The Ultimate Warrior in 1 minute 39 seconds in 1996.